"Join us in beautiful southern Portugal to immerse yourself in an eco printing extravaganza! From collection at Faro Airport to the wonderful surrounds of the Algarve Art Retreat near Loulé we look forward to welcoming you to this beautiful rural location. 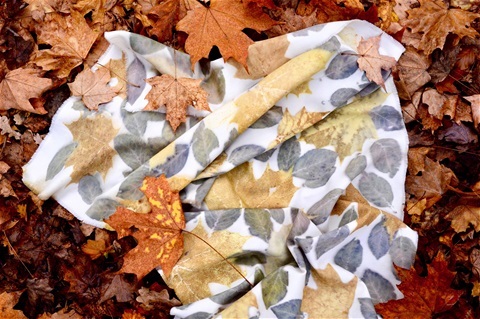 Join us as we gather local vegetation, explore eco print, natural dye and shibori possiblities then transform this knowledge into beautiful fabric or up-cycled clothing. This year we offer one exclusive ten day retreat to facilitate a creative, comfortable and relaxed environment." The Algarve Art Retreat has fabulous grounds, a large pool and a sauna. It is reserved exclusively for us during the retreat so that everyone can feel totally relaxed. There is also a spa room where a range of treatments may be booked! Prices range from €1700 sharing to €2700 single per person at the Algarve Art Retreat for the ten days and include all excursions and meals as per the programme above. The retreat fee includes all the necessary dyes, mordants and tannins that we will be using during class. A materials list will be provided for participants. On the evenings that dinner is not provided participants will be free to relax on site or dine out in one of the local Portuguese restaurants. Taxis are a very easy way of getting around but some of the accommodation has its own simple kitchen facilities and it may also be possible to barbecue on site! Workshop accommodation at Quinta do Moinho costs €1600 per person sharing or €2000 single and is a simpler option than the main retreat location but is much nearer the market, shops, museums, churches and restaurants in Loulé. Participants who choose to stay at the Quinta will be collected there each morning following a simple breakfast and dropped back again after the workshop ends each night. They will have full use of all the facilities on site at the Algarve Art Retreat each day so won't miss out on any of the fun! We will however be giving first preference to those who book their accommodation on site. A 50% deposit now will secure your place with the balance payable in the middle of March 2019. Non workshop participating partners may be accommodated by prior arrangement. Please note, retreat fees will be strictly non-refundable so Nicola and Caroline highly recommend holiday insurance. 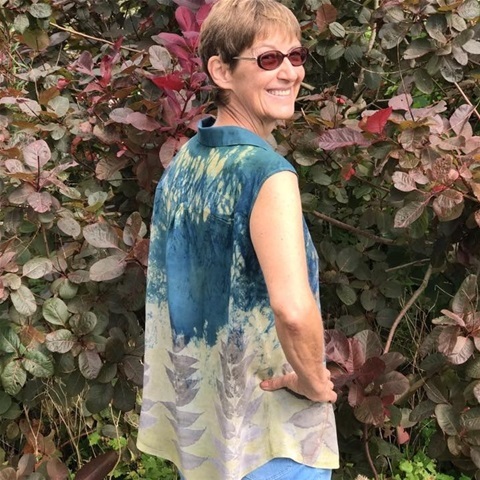 A 1 day workshop for people who are complete beginners, and for those who already have some experience of ecoprinting but are not yet getting the clear and vivid prints they desire. Working with samples of different fabrics you will learn the fundamentals of mordanting, leaf choice, bundling techniques and steaming. By the end of the day you will have learnt several different techniques to get the best out of your leaves. 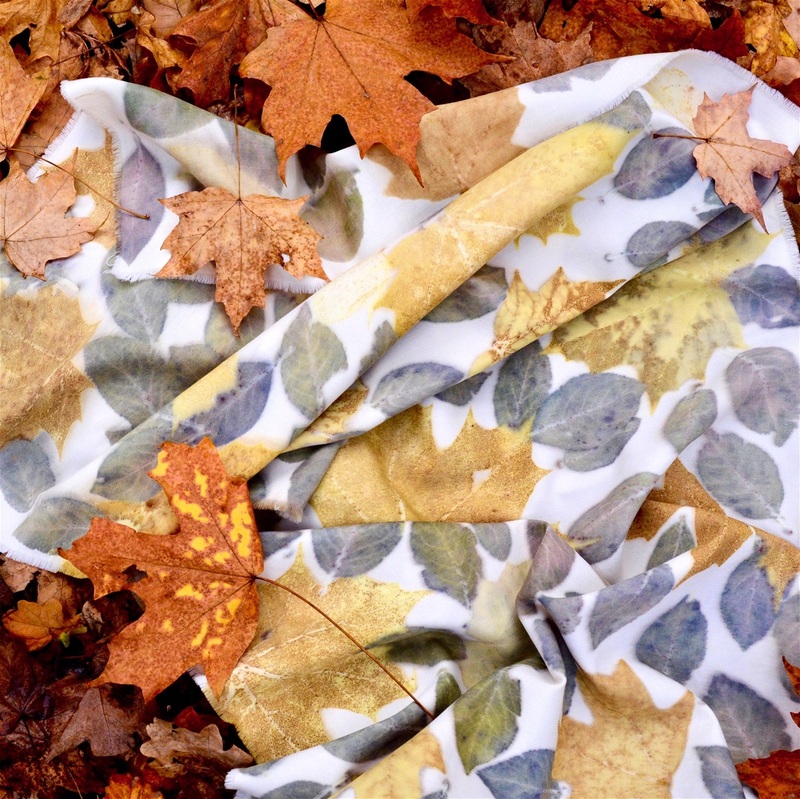 In the afternoon you will print a silk scarf using the method of your choice. Indigo is a glorious and versatile pigment that combines beautifully with ecoprint, and can greatly enhance your results. 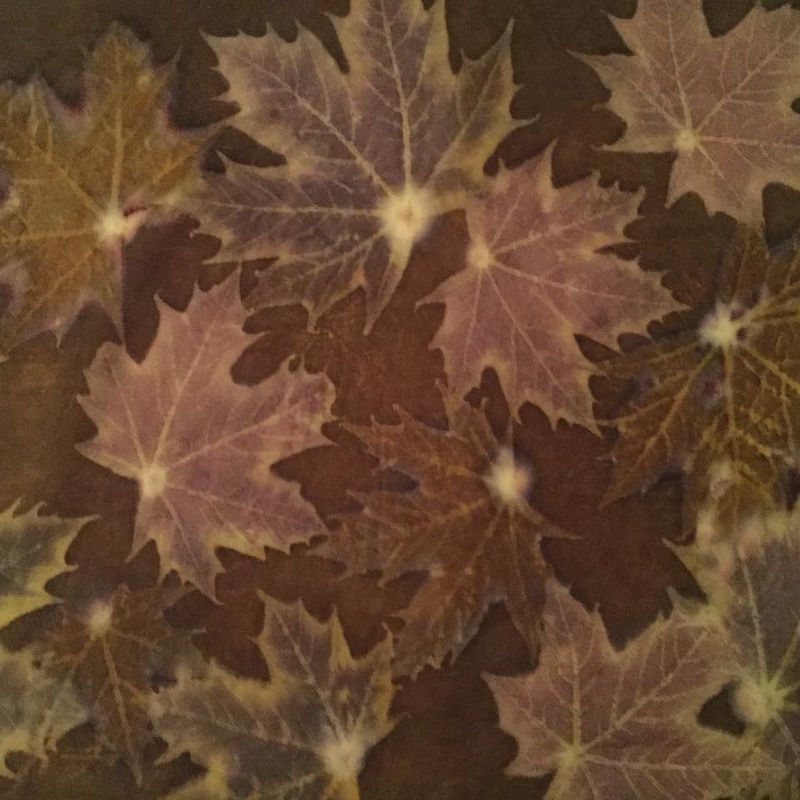 This course is for participants who have some ecoprint experience - who know how to produce clear prints and understand the basics of mordanting. However I shall also be running a one day beginners course the day before, so beginners could combine the two courses. You will learn how to make an indigo vat, and how to combine indigo with ecoprint before during and after the bundling process. 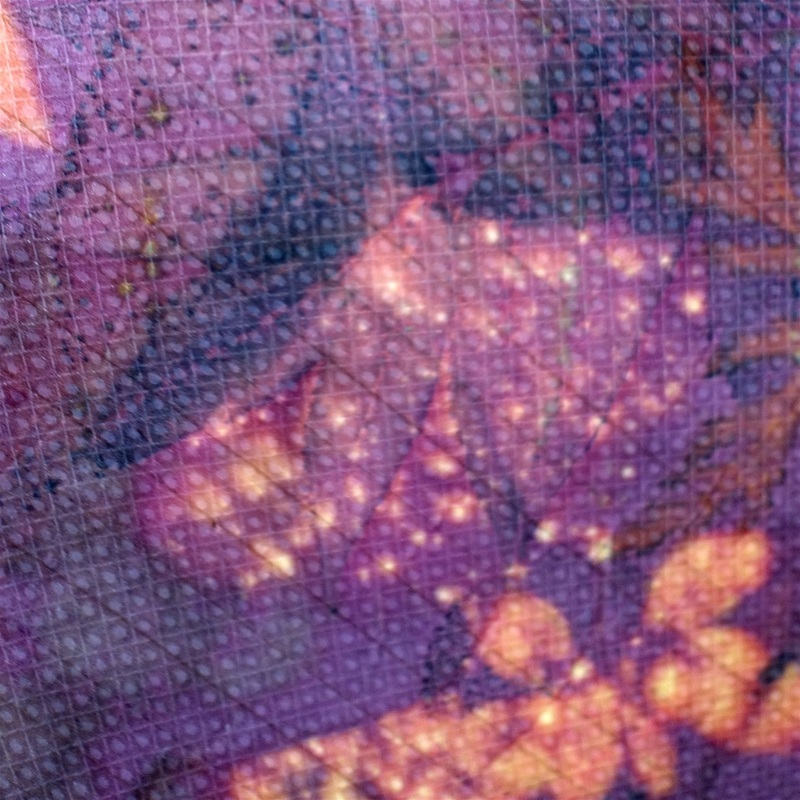 We will also use simple shibori techniques to add texture and pattern. The vat we will use will be a synthetic one, because I find this to be the most reliable and tolerant of intensive workshop use, but we will also discuss making organic vats. We will work with both protein and cellulose fabrics. The course will be held at my home in South Warwickshire and you will have access to tried and trusted foliage for printing from my garden. 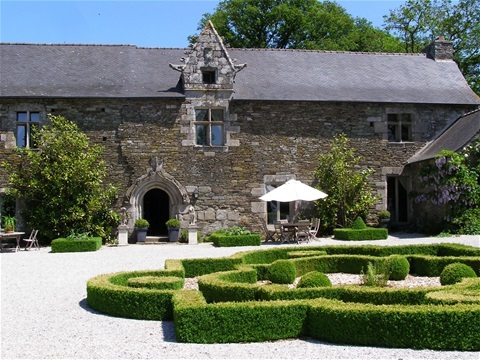 Manoir de Kerledan is a beautifully restored 15th century Manor House offering luxurious accommodation. Working in a spacious studio, we will immerse ourselves in the magical world of ecoprint, natural dye and indigo.The wonderful gardens will provide us with an abundance of vegetation. Breakfast lunch and dinner will be served, using fresh local produce, some of it grown in the potager at Kerledan. Emphasis will be on European and Middle Eastern flavours, special dietary needs can be accommodated. House wine will be provided with dinner. On one half day we will have an outing to a local brocante, and to the 'Valley of the Saints', where the 1000 saints of Brittany are sculpted out of monumental pieces of rock. On that day, lunch will be at a local restaurant, at participants' expense. The retreat is suitable for both beginners and experienced printers. As the group size is small there will be plenty of individual tuition and support for each participant. You will have the opportunity to combine ecoprint with natural dye and indigo, and to print scarves, garments and fabric to use for your own projects. Booking opens on Saturday 17th November 2018. A 250 euro deposit (non refundable) will secure your place. Contact info@kerledan.com to book.